When it comes to homeopathic remedies, homeopathic aconite should definitely be on the list of the ones you need to know. Not only is it one of the system’s oldest remedies, but it is also a versatile form of therapy used for a variety of health conditions. For instance, it is among the first remedies homeopaths turn to for sore throats and coughs, while it is also used for fear of flying or shock due to turbulence. As a result, homeopathic aconite is among the top homeopathic remedies for first aid kits whenever a symptom or problem arises suddenly. It comes from the plant Aconitum napellus, which has an interesting history as both a medicine and a deadly poison. It is important to avoid confusing homeopathic aconite with herbal aconite, as the latter can have very serious side effects, including death. However, in its homeopathic form, aconite is so diluted that it is considered to be safe and effective for most uses. Read on to learn about homeopathic aconite, and its many health benefits. In the world of medicinal herbs, simply none compare to aconite—also called monkshood. Again, aconite is known for its medicinal and poisonous effects, which give the herb quite an interesting and infamous history. In traditional Chinese medicine, it was believed that aconite root, or fu zi in Mandarin, was so medicinally indispensable that it could even resurrect the dead. In witch lore, aconite root or leaves are used to protect against negative energies during rituals. In the Harry Potter universe, aconite root has also been used as a potion ingredient. This is why another name for aconite is witch’s flower. On the other hand, the plant also has a dark reputation as a poison. Whenever making aconite into an herbal or homeopathic remedy, gloves are worn, and hands are washed thoroughly when contact is made. Improper use and high doses of aconite are extremely toxic, and can cause a number of negative effects, including cardiac arrest, respiratory paralysis, and even death. The Greeks reportedly called it the “Queen of all Poisons.” It is also thought that the Roman emperor Claudius was murdered with aconite. The aconite plant is native to North America, Asia, and Europe, and it thrives in moist pastures and windy mountainous areas. It is most commonly found in damp places with shade such as highland meadows, ditches, and along streams. There are over 100 aconite species, and they vary in height between two and six feet. In general, aconite has dark green leaves and flowers with shades of white, yellow, blue, and purple, which is a color that attracts bumble bees in particular. Aconite is one of oldest remedies in homeopathy. In fact, after homeopathy founder Samuel Hahnemann proved the remedy in 1805, it was featured in the original volume of his landmark book on homeopathy, the Materia Medica Pura. Aconite is considered to be a perfect remedy that exemplifies the homeopathic principle that “like cures like.” This means that although the aconite plant has potential harmful effects, when it is heavily diluted into a homeopathic remedy, it can effectively treat a variety of health conditions. Homeopaths will consider aconite for the excitable person that is generally healthy and strong; however, they develop illness rapidly and exhibit a sudden decrease in strength. The person’s physical and mental symptoms are comparable to a storm where they arise suddenly, and yet disappear quickly. Aconite is used for diarrhea, stroke recovery, heart palpitations, insomnia and sleeplessness, absent menstrual periods (amenorrhea), problems in labor, strengthening the kidneys and adrenals, and for the first signs of measles. The following is further detail about the health benefits of aconite. Aconite is a top homeopathic remedy for respiratory infection, especially when cold or flu symptoms set in rapidly after exposure to cold or dry winds. It is used for symptoms such as sore throats, coughs, fevers, and croup as well as laryngitis and bronchitis. Severe headaches will also develop with a craving for cold drinks. Symptoms tend to worsen from heat and stuffy rooms; however, symptoms improve from lying down, fresh air, and warmth. Stomatitis is an inflamed and sore mouth that can interfere with a person’s ability to eat, talk, and sleep. Cold sores, canker sores, and mouth irritation are all forms of stomatitis. Traumeel is homeopathic oral rinse that contains aconite 2X (low potency). A randomized, placebo-controlled, double-blind study published in the journal Cancer in 2001 found that Traumeel may significantly reduce the severity and duration of chemotherapy-induced stomatitis in children undergoing bone marrow transplantation. The study included 32 patients between the ages of three and 25 years old. Homeopathic aconite may also be great for ear and eye infections. For instance, it is said to be useful for injuries to the eye or retina, and inflamed eyes with burning and aching pains often due to conjunctivitis or an eye injury. The eyes may also be oversensitive to light. Ear infections may also develop rapidly, and cause intense pain, bright red ears, and noise hypersensitivity. Other symptoms may include a higher fever, restlessness, and fearful agitation. The person thrives with a quiet environment, but light and noise worsen symptoms. 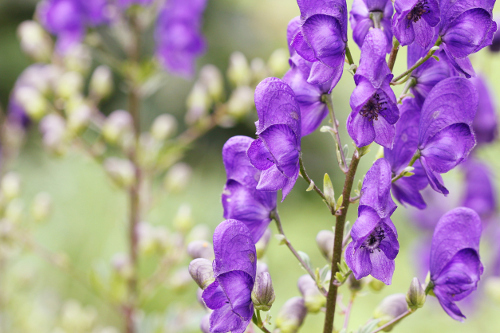 Aconite is a go-to homeopathic remedy for emotional disorders, especially fear and anxiety. It is used for anxiety when there is restlessness and dilated pupils. Injuries, accidents, fevers, shock, and earthquake can all be reasons for the person’s anxiety. Panic attacks will also be quite intense. Aconite is also used for depression after an episode of shock or fright that is linked with fear of death. The person also experiences a feeling of losing control, and a fear of the outdoors, crowds, and narrow spaces. The person may hyperventilate, and experience other symptoms such as numbness, tingling, faintness, and palpitations. Resting and open air will likely improve symptoms; however, music and cold winds will worsen symptoms. Neuralgia is a condition of nerve irritation in the limbs, face, or trunk. Homeopathic aconite could help relieve the sudden and violent pain associated with neuralgia. There may also be a numb, heavy, and tingling feeling. Neuralgia will be experienced after cold drafts, surgery, being frightened, and sweating. Symptoms will get better from open air and stillness; however, things will worsen from noise, motion, touch, being on the right side, and at night. As mentioned, aconite is one of the top homeopathic painkillers. As a result, it is thought to be the best remedy for shock and fear directly after fractures, sprains, burns, bruises, and injuries. It is also used for sensitive wounds, local inflammation, and fever after surgery or injury. In addition, it is used for acute symptoms of osteoarthritis, including shooting pains in the joints, tingling, and numbness. Although homeopathic aconite can easily be found in the homeopathy section of health food stores, it is important to be aware that herbal aconite supplements can be found as teas, extracts, powders, tablets, ointments, liniments, tinctures, and as an essential oil. The purported health benefits of homeopathic and herbal aconite are somewhat similar. For instance, herbal aconite is also used to treat ear and eye problems, anxiety, insomnia, headaches, fever, measles, pain, wounds, bruises, diarrhea, and respiratory conditions like bronchitis. Other uses of herbal aconite include heart rate regulation, facial paralysis, high blood pressure, infertility, hypothermia, and hair loss. Some studies also promote the anti-inflammatory, hypoglycemic, and free radical scavenging ability of herbal aconite. But again, it must be noted that herbal aconite can be extremely poisonous, and even fatal in large doses. Other notable effects include nausea, vomiting, an abnormal heartbeat, and respiratory problems. It is also wise for pregnant and breastfeeding women to avoid aconite. In fact, due to the risks of poisoning, some medical authorities advise against the use of aconite in all forms, homeopathic or otherwise. If you choose to try herbal aconite, it should also only be taken under supervision of a trained herbalist, TCM doctor, or other expert in herbs. As with most homeopathic remedies, it is a good idea to speak with a professionally trained homeopath to see if homeopathic aconite is the right choice for you. In a comprehensive initial assessment, a homeopath retrieves a person’s physical, mental, and emotional symptoms to help determine if a particular remedy is a good fit. In the case of aconite, it may be an appropriate remedy for people with respiratory infections, stomatitis, eye and ear infections, emotional disorders, neuralgia, and other conditions associated with pain. However, be mindful of the dangerous side effects of aconite and only use with caution. Lockie, A., Encyclopedia of Homeopathy: The Definitive Home Reference Guide to Homeopathic Remedies and Treatments for Common Ailments (New York: DK Publishing, Inc., 2000), 34, 99, 183, 186-187, 196, 211-212, 218-219, 226-229, 238-239, 244-245, 248-251, 256-257, 271, 275. Hershoff, A., N.D., Homeopathic Remedies: A Quick and Easy Guide to Common Disorders and Their Homeopathic Treatments (New York: Penguin Putnam Inc., 1999), 100-101, 140-141, 162-163, 197, 208-209, 214-215, 234-235. “Aconite (Monkshood, Fu Zi),” Chinese Herbs Healing; http://www.chineseherbshealing.com/aconite-monkshood/, last accessed May 16, 2017. Alibeau, J.P., et al., “[Aconite in homeopathic relief of post-operative pain and agitation in children],” Pediatrie, 1990; 45(7-8):465-466. https://www.ncbi.nlm.nih.gov/pubmed/2170921, last accessed May 16, 2017. Oberbaum, M., et al., “TRAUMEEL S in the treatment of chemotherapy-induced stomatitis in children undergoing stem cell transplantation,” Cancer, Aug. 1, 2001; 92(3): 684-690, doi: 10.1002/1097-0142(20010891)92:3 , last accessed May 16, 2017. “Aconite,” British Homeopathic Association; http://www.britishhomeopathic.org/bha-charity/how-we-can-help/medicine-a-z/aconite/, last accessed May 16, 2015. “Aconite napellus (Acon. ),” HomeopathyPlus; http://homeopathyplus.com/aconite-napellus/, last accessed May 16, 2017. “Aconitum Napellus/Acon,” Home Remedy Central; http://www.homeremedycentral.com/en/homeopathic-remedies/homeopathy/aconite.html, last accessed May 16, 2017.